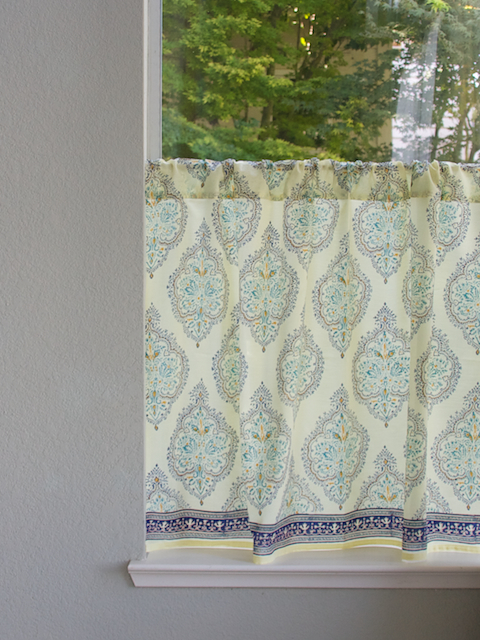 We are so excited to be launching our line of kitchen curtains. Kitchen curtains vs. café curtains vs. tier curtains? The terms kitchen curtains and café curtains are used interchangeably. 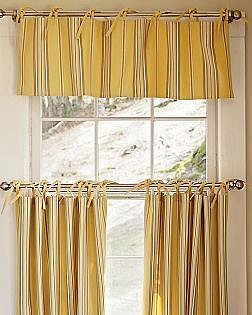 In both styles, the lower half of the window is covered by one full curtain, while the top half may or may not have a partial valance or simple curtain frill. The gap between these two allows light into the kitchen, while the lower curtain shields the occupants from anyone looking in. Café curtains were named so after a chic French invention, and created for cafés which look out onto the street, a way of maintaining privacy in the café while still letting in plenty of light. Tier curtains are kitchen curtains that can cover the bottom half of a window, but they are usually ruffled or tiered, and may or may not include a valance. They add a definite country flair to the kitchen. When we think of the time we spend in the kitchen, we definitely want it to be a space we enjoy. I don’t know about your home, but every time we have guests over for a meal, somehow or the other, no matter how much I try (and how hard I’ve scrubbed and cleaned the living room), we end up congregating in the kitchen. Hanging kitchen curtains is an easy way to add a bit of style to a kitchen or to give it that finished look without it being a pricey investment . Here are more reasons why I think kitchen curtains are a spectacular idea…..
Cafe curtains provide just the right amount of privacy to kitchens, yet allow for adequate amount of light to enter it. The amount of variety you can add in terms of looks is great with these curtains. The patterns, designs, colors, and textures allow for great variety that is rare with any other kind of kitchen window treatments. Our kitchen curtains are available in patterns and colors suited to virtually any style or theme, and in addition – they are easy to use and maintain for the kitchen. Finally, the best thing about cafe curtains is that they are highly affordable. 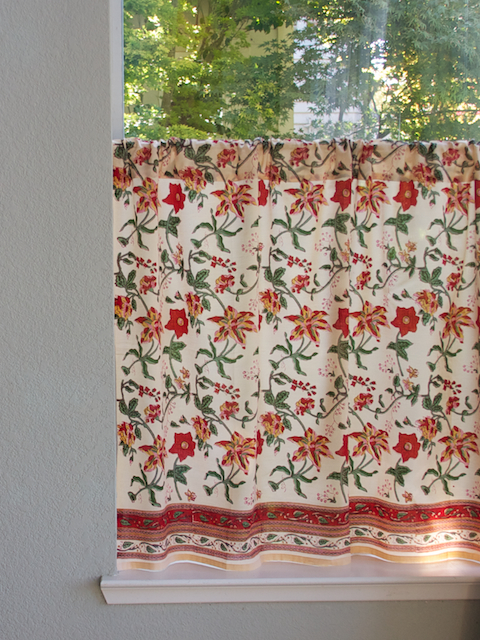 Aren’t you wondering how you ever lived without these versatile gorgeously patterned, hand-made, fair trade cafe curtains in your kitchen? Why stop at the kitchen? 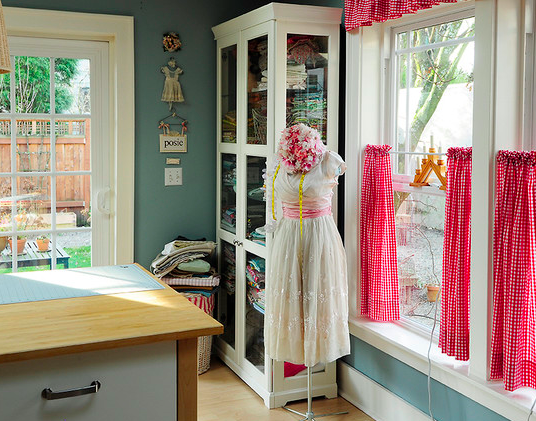 Kitchen or cafe curtains do not have to be limited to kitchens. Along with coordinating valances, they can be used in virtually any room where you are looking to filter some of the light out, yet keep the space open and inviting. Depending on the kind of windows you have, laundry rooms, foyers, hobby rooms and bedrooms are all great choices. If you’re looking for some quick examples, here are some kitchen curtain ideas to inspire you. What a difference café curtains make in this picture. Full curtains would not only have obscured the view but would have lent a formal, heavy air to the room. 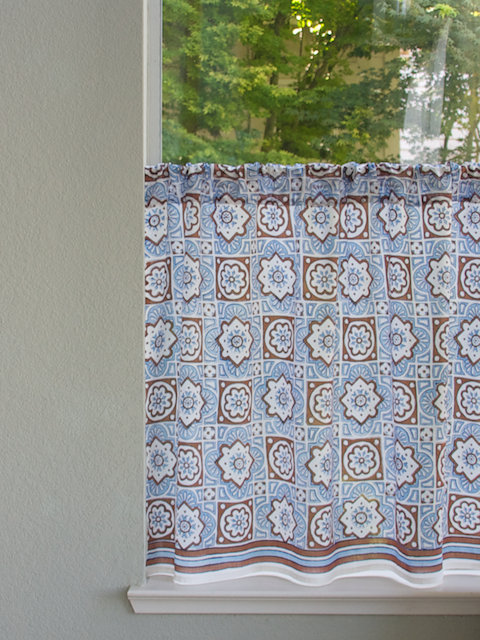 Kitchen curtains lighten the space, provide needed privacy and lend an informal, casual feel. Another perfect example of the versatility of café curtains. If you’re lucky enough to have a bath with gorgeous windows like these, café curtains will not only give you privacy, but let in much needed bright light and sunshine! Chosen to match your decor and theme, they will add that finished look to the bath. A beautiful hobby room – of a seamstress no doubt – looks absolutely lovely with these gingham checked red and white café curtains. 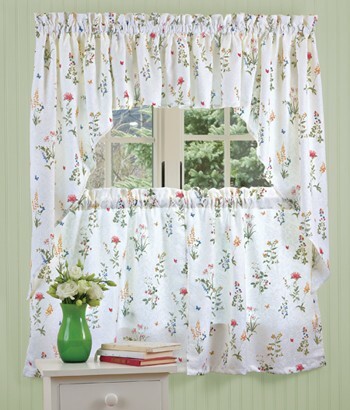 A coordinating valance, which is purely a personal choice, enhances and adds a finished look. Café curtains in a foyer let in streaming sunlight, add a touch of style to the window and provide privacy without compromising on the view outside. Another example when full drapes instead would have been heavy and formal. Café curtains used to stunning advantage in a living room. YES, a living room! Coordinating with the upholstery and in keeping with the casual, informal appeal of this room, the cotton curtains are somewhat formal, but yet informal, by virtue of its print. From deep rich exotic prints and jewel tones shimmering ones to bold geometrics and pretty florals, we have you covered. 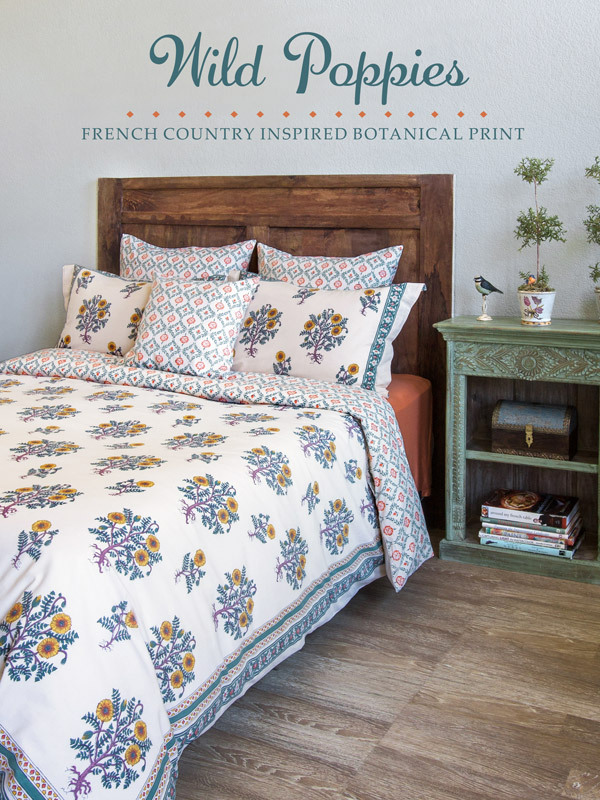 Whether your personal style is shabby chic or uber modern, mid century or French country, we have the right print for you. Our curtains are printed on cotton voile – a soft, light, gossamer cotton weave, with wonderful light filtering properties so you can enjoy your privacy without having to sacrifice a well lit kitchen. 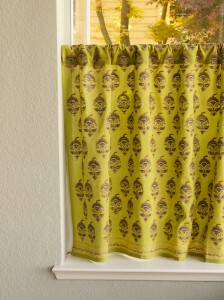 Each curtain is printed on preshrunk, superior grade cotton and is exquisitely finished. These will normally be sold in standard widths of 46″ and 3 lengths of 24″, 30″ and 36″. Of course if you choose custom kitchen curtains, you get to choose the width and the length! Here are my top picks for each season. With the Fall season and the holidays fast approaching, we are getting ready to entertain family and friends at home. Here are my top 3 recommendations for a fall entertainment ready kitchen! Cinnamon brown, turmeric yellow and cranberry red all come alive in Spice Route. 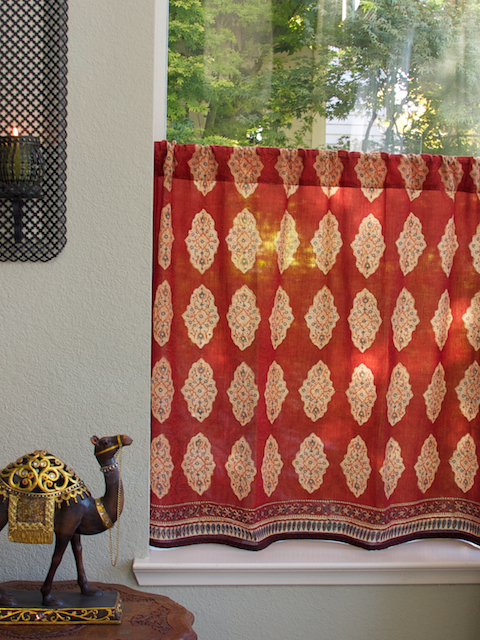 The Moroccan inspired cafe curtains will warm up your eating space when temperatures start dropping and add unique personality. 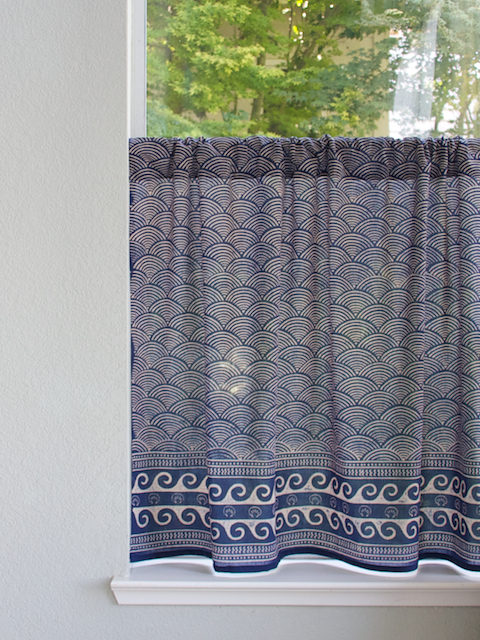 To see how to add some flair to your Thanksgiving decor with these curtains, go here. 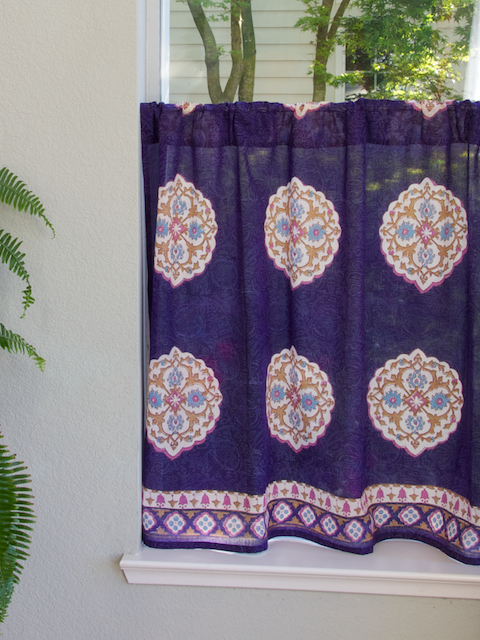 Summers come and go, but you can keep a beachy vibe all year long with our hand printed Waltz of the Vines cotton curtain. Muted yellows and blues play softly in ocean-inspired designs that lend themselves to natural and organic decor. If you need some ideas on how to use these for Thanksgiving, read this. You’ll love bringing the glow of Memories of Shalimar into your kitchen. Navy and chocolate motifs outlined in gold, on a meadow green background will bring out the warmth of any natural and organic tones in your kitchen, as well as the warmth in your heart. A tradition Christmas or a modern stylish take on tradition, or maybe even a white Christmas?? Whatever your entertaining style is, one of these three picks will work. Bring a rich, deeply exotic vibe to your kitchen with Ruby Kilim, a print inspired by the famed Turkish kilim rugs. If you are naturally drawn to warm, earthy colors and love cooking international foods and spicy dishes, then this print will complement you and your culinary talents! To use these with our other kilim inspired print, Kilim Noir, for a truly tribal take on Thanksgiving, go here. If you want an “island” feel in your kitchen, a tropical palette like Tropical Garden can help open up the space. Dot the room with bold splashes of reds and yellows by way of dishes, towels and other small accessories. Read this post to see how to use these with your Tropical Garden table linens for a Thanksgiving that oozes tropical island style. Our shimmering white on white Vanilla Glacé curtain speaks volumes in a whisper. Use this curtain to create a kitchen decor that is a study in subtle contrasts: clean and ornate; simple and sophisticated. Before we know it, spring will be here. Here are my favorites for this season of birth and renewal! 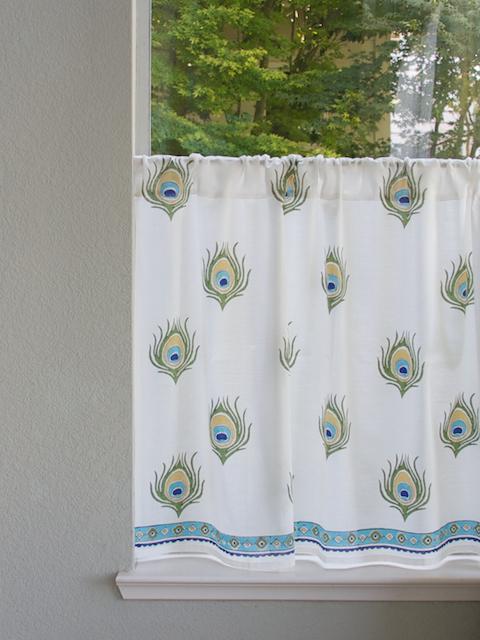 Inspired by the peacock that dances in the forest and announces the arrival of spring, Dance O Peacock curtains will add just that right amount of style and elan! The dazzling iridescent colors of blue, green and ochre will transform the room and work with all decor styles! Morning Dew has a fresh, Provencal palette perfect for spring. A simple meal will turn into a culinary masterpiece in your kitchen, when you decorate with these beautiful bold medallion-ed linens imbued with French flair. Create a casually brilliant global kitchen with our vibrant blue Sultan’s Palace. Large brightly colored medallions cover a blue on blue ground in a nod to Moroccan design. Handcrafted and unique, this showstopper will inspire the rest of your kitchen decor. Warm breezes, trips to the ocean and summer vacations beg for prints that are fun, easy going, casual and coastal. Here are my three choices for summer. Inspired by Japanese pottery but also embracing a relaxed coastal feel at the same time, Pacific Blue’s coastal print will bring the ocean right into your kitchen. Accessorize with Oriental bowls to complement the Zen vibe, or with rustic natural items like real seashells and driftwood to highlight the coastal theme. 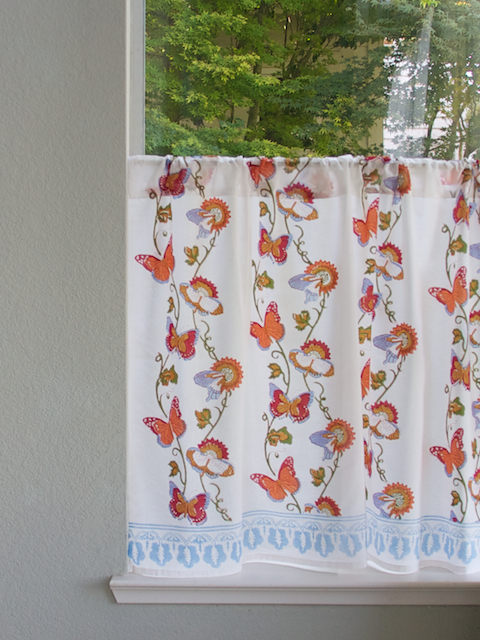 A fun, flirty and vivacious print, your kitchen will take on an intangible, “je ne sais quoi” quality with Chasing Butterflies cafe curtains. 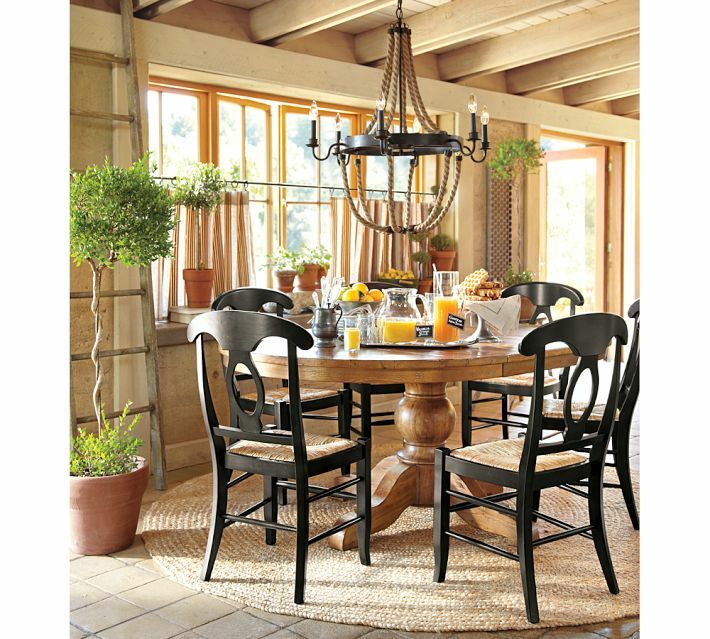 Invoking the lazy, languid days of summer, it is a perfect choice for a kitchen where French country decor rules! Ocean Breezes has colors of the sun and the sand – warm azure blue, sandy brown and ivory in a geometric pattern inspired by Moroccan tiles! Consider painted white washed walls, wicker and woven accessories, and found objects like shells and driftwood to emphasize the coastal theme. 1. 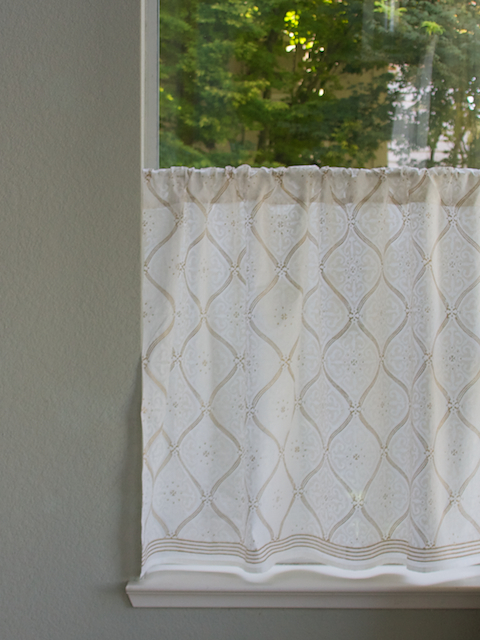 Size/width of rod: Our kitchen curtains come with a 3-inch rod pocket for easy hanging. Decide how much you want the curtain rods to extend at each side of the windows. 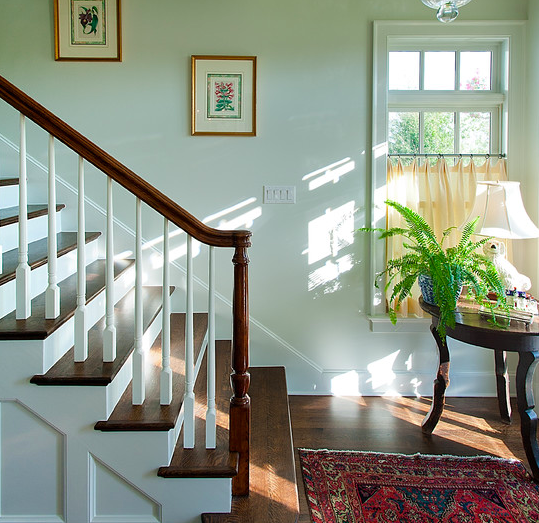 Two to three inches would be the norm (excluding any finials) but you may want more clearance to let in maximum light. Again consider the window and room proportions when you do this. An inch or two further would be fine however. 2. 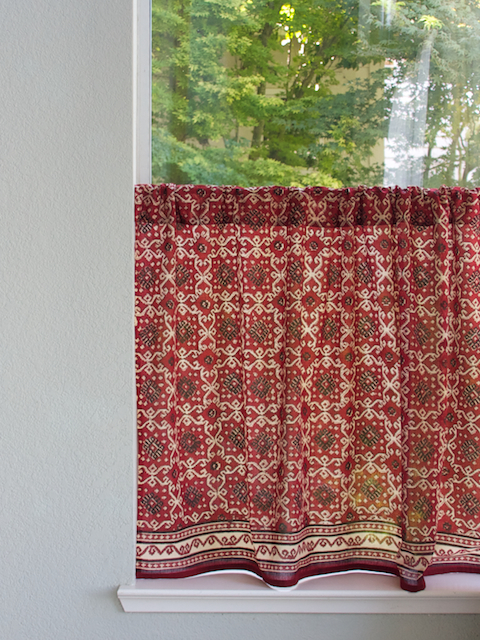 Width of curtains: Our curtains are 46″ wide. Depending on the width of the window you will have one or two panels, which together will span the width of the window (the wider the curtains the more fullness you achieve). So if the desired width is 24″, one panel 46″ wide will suffice. 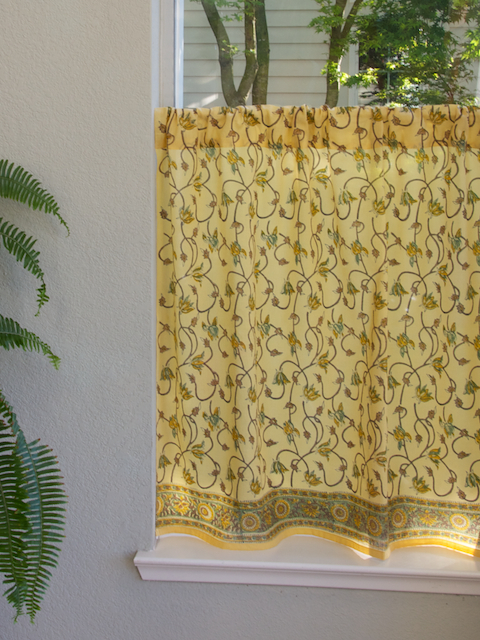 If the desired width is 36 inches then you need 2 curtains, each 46 inches wide. 3. Length of curtains: Plan where the curtains will end. 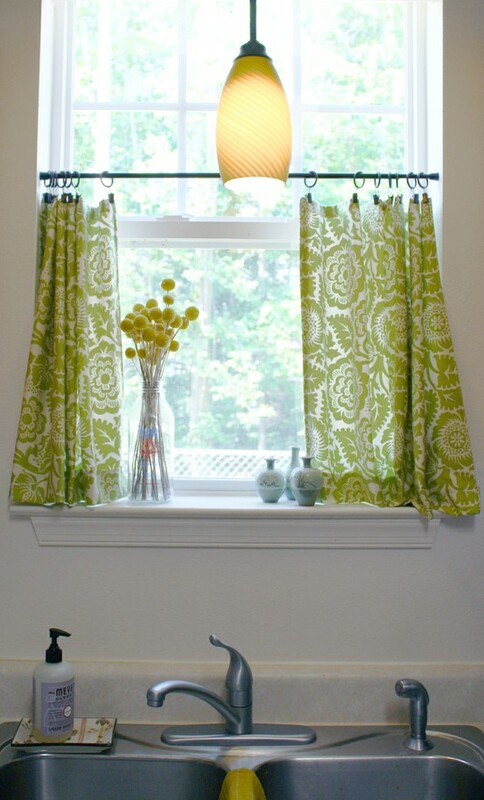 If you want window length curtains this would normally be 2 or 3 inches below the window sill. So the finished length of curtain would be from the rod or pole to the finished length. 4. Location of curtains: If your kitchen opens to another room, like a family room or den, make sure that your curtains coordinate with the window treatments in the other space. But if you happen to have Saffron Marigold curtains in your other rooms, you are fine. 🙂 Because one of the great things about our linens – they mix and match beautifully with each other. Click here to browse our kitchen curtains collection. Do let us know if you found the post useful. ← How are You Decorating For Fall?